Do you always use the same facial cleansers? Or do you change brands once you are through with your current one? I was very much into one from Estee Lauder called the Perfectly Clean Foaming Facial Cleanser which filled my needs but sort of lacked the umph that I was looking for. I went through a few different ones, mostly drugstore brands with different price points. None did it for me and the current one Total Effects Revitalizing Foaming Cleanser by Olay supposedly claims to deliver 7 anti-aging properties in one! I am sorry to report that it did not deliver even on its basic claim which is "thorough cleansing while enhancing skins natural radiance" - quite disappointing. My cleansing routine with makeup on is to first use a cleansing cloth to remove all makeup especially waterproof stuff off my face. I then follow up with a cleanser to thoroughly cleanse whatever is left. This ensures that there are no traces of makeup and takes care of my skin. There is nothing like the feel of a freshly cleansed face after a long day of wearing makeup, I tell you. The problem with Olay was that each time I washed my face, it still did not feel clean. When I look in the mirror, I certainly saw a clean face with no trace of makeup but when I used a toner which I sometimes do just to have a once over around the hairline and on my neck which are notorious places that hold traces of foundation and soap, I noticed that there was a whole lot of residue on the cotton pad! And this was consistent everyday. I wash my face three times a day - once in the morning, again in the evening as soon as I get back from work and then once more before I retire for the night. I only use a toner in the evening (sometimes) and morning to prep my face for my makeup. So all in all, this cleanser does nothing to achieve a thoroughly cleansed face. I recently became interested in the Vichy range of products which are available at our pharmacies and my first purchase was this cream cleanser. The clincher? The fact that it is parabens free and does not dry the skin. I was sold from the first use. I loved the scent which is fresh yet mild and the creamy consistency of it as well as the fact that you do not need to use a whole lot to clean your face. The claims are that it will cleanse from deep within without leaving your skin feeling dry and indeed I can say that this is true. My skin feels fresh and soft as well as cleansed well after I use this and I love that. Its plain, simple, no frills and no silly claims about a million other things it can do for me while cleansing.....I like that. What facial cleansers are currently on your list of favourites? 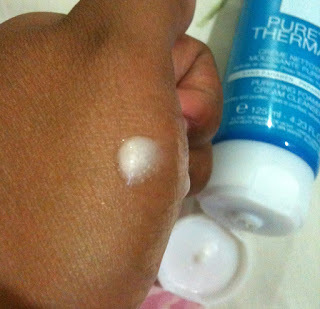 Vichy Purete Thermale Purifying Foaming Cream Cleanser is certainly on mine!